Nigerian militant group Boko Haram has pledged allegiance to Islamic State (IS), in an audio message posted from the group's Twitter account. The announcement clearly has the potential to raise the stakes in the ongoing conflict in Nigeria. More than 13,000 people have been killed during violence in the country, which in recent times has extended beyond its borders. If it turns out to be more than propaganda, and creates an overt IS franchise in this highly volatile region, then it will present an even bigger challenge to Nigeria and its neighbours. Major powers already alarmed about the influence of Islamic group will also be concerned. But for now it is unclear what effect the move will have on the ground. In reality, it is no great surprise that the leader of Boko Haram, Abubakar Shekau, made the announcement that the group was formally aligning itself with IS. Last year, when Boko Haram captured the town of Gwoza in Borno State, it declared it to be part of a so-called caliphate - as IS has done with the swathe of territory it has seized in Syria and Iraq. Also, Boko Haram videos have begun to look more like the sophisticated IS products, suggesting a possible collusion in their "branding". The timing of the Boko Haram announcement could be related to the pressure its forces have been under recently from the Nigerian military and from regional allies Chad, Niger and Cameroon. 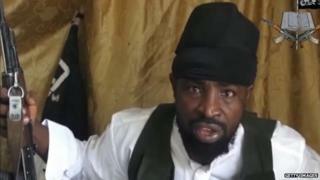 Boko Haram fighters have been pushed out of a number of towns in north-eastern Nigeria. If the group was trying to reassert its presence with the declaration of allegiance to IS, it also came just hours after more than 50 people were killed in a series of bombings in the Borno state capital, Maiduguri. Two of them happened in markets and third close to a busy bus terminal. They bore the hallmarks of Boko Haram. The war between Boko Haram, which means "Western education is forbidden" in the Hausa language, and the Nigerian government remains relentlessly deadly and destabilising. The timing of the IS-Boko Haram allegiance pledge could also be related, some say, to the growing IS influence in Libya. Smuggling routes from there across the Sahara are thought to have been one conduit for weapons and ammunition to Boko Haram. After the announcement, a Nigerian government spokesman said: "It's sad, it's bad. It is why we are appealing to the international community. "Hopefully the world will wake up to the disaster unfolding here." Some of the tactics for which IS has become so notorious, including the beheading of captives, have been used by Boko Haram. If the group was to step up such actions as a result of aligning themselves with IS, then the prospects could indeed be even more grim. Nigeria is a country on the fault between Islam and Christianity in Africa, where clashes with religious overtones are not uncommon. But there are factors that complicate all the predictions about what could happen now. Many of the groups in Africa that are open to falling under jihadi extremist influence also have members who see themselves as fighting a much more local cause. It could lead to splits over ideology and strategy. It was the case when Somalia's al-Shabab linked up with al-Qaeda. There has also been growing international concern about the risk of a joined up jihadi-led arc of instability that would need to be confronted across the northern part of the continent. Al-Qaeda in the Land of the Islamic Maghreb (AQIM) has been entrenching itself in several countries in the Sahel on the other side of Africa. Meanwhile, nearby Sudan, South Sudan and the Central African Republic are facing security issues and many other problems. The British government called it a potential challenge for generations to come. Now IS is in that mix, gaining allies in Nigeria, the region's economic powerhouse and Africa's most populous country. Propaganda is vital to the cause, whether the driving force is IS or al-Qaeda. Local politics are often another ingredient. And civilians are always caught in the middle.